X-Large - $49.99 Only 4 left! Roadhog is one brutal dude. He lives in the harsh Outback environment. He runs around the battlefield wielding nothing but a hook and his scrap gun. He can take a rocket punch from Doomfist and shake it off like it was nothing! 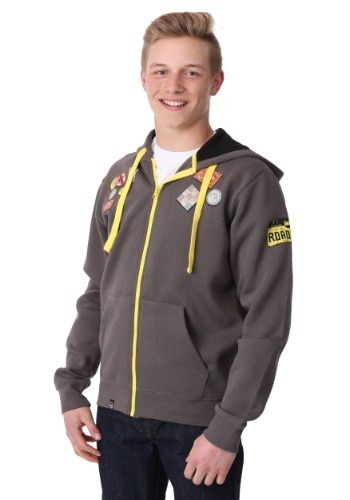 He's the Overwatch character known for getting hog wild and he's perfect for players who like brute force... and this officially licensed Overwatch hoodie is for those who want to add a little brute force into their wardrobe. This Overwatch Roadhog Ultimate Hoodie is for fans of the video game and Roadhog mains. The hoodie is a classic zip-style hoodie and is knitted from a cotton, polyester, and spandex blend for a comfortable fit. It comes with plenty of printed decals on the front and back, each one adding a little Roadhog style to the sweatshirt. It even has the "Wild Hog Power" tattoo printed onto the back of it! Now, we don't recommend rampaging through the Outback with a hook, like how Roadhog does it in the video games. We do, however, recommend wearing this comfortable Roadhog hoodie the next time you want to make a few brutal plays in your next Overwatch marathon.